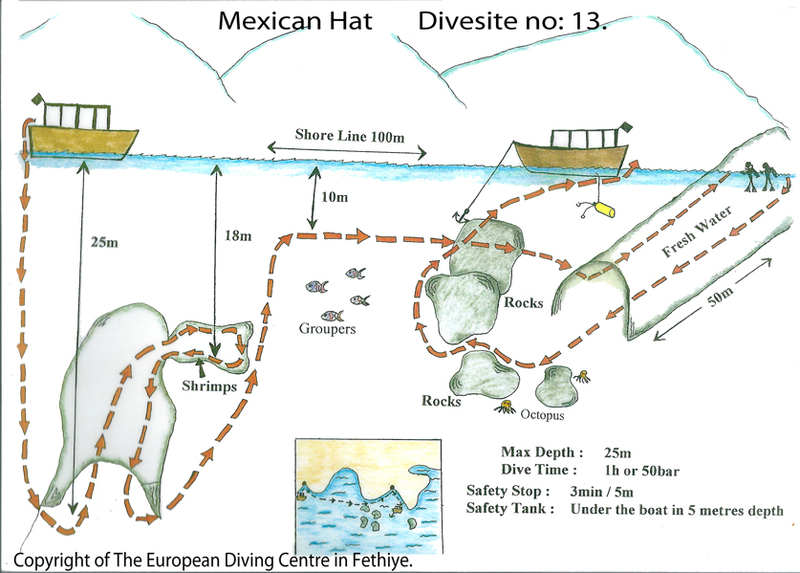 Mexican Hat » European Diving Centre Fethiye. This dive site also consists of two elements. The first part requires divers to drop down to 29 metres and then one at a time be called forward to visit the shrimp room. With the aid of a torch, thousands of shrimps can be seen living in their natural environment. Good buoyancy control is essential here to allow following divers a chance to experience this phenomenon. When all divers have exited, there follows a 100 metre swim to the second element of the dive. Coming shallow to conserve air. The second part of the dive involves swimming into a large tunnel, the opening of which is 25 metres wide. The tunnel narrows during its 90 metre length and requires a torch. Halfway up the tunnel the water turns from salt to fresh and its temperature drops quite significantly. Safety stops are carried out here before surfacing in a closed room to talk about how cold it is. After a couple of minutes divers re-descend to a maximum depth of 5 metres for the short swim to our waiting dive boat. The first part of this dive is restricted to AOW divers and above, however the second part is quite within the reach of open water divers.